Here you can find some of the caves that I have explored. I've divided the caves into two main groups: Show and Wild. 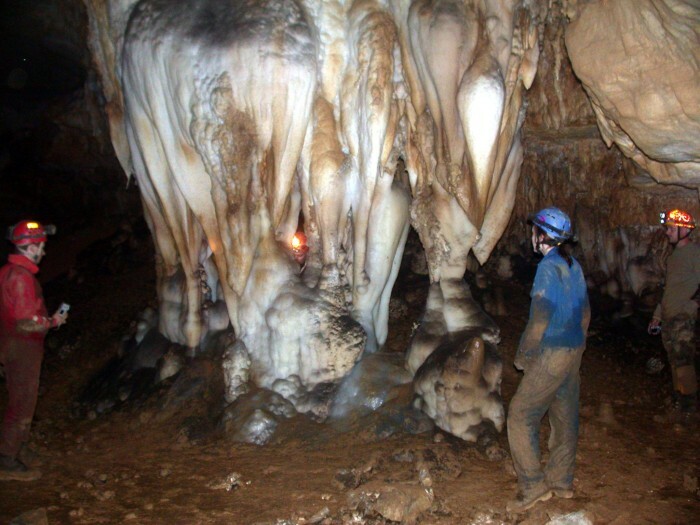 Show caves are developed tourist caves and Wild caves are just that - in their natural state. Just use the menu to the upper or lower right to make your choice. The show caves list is a little incomplete because I've been to more show caves (mostly as a kid) including Luray Caverns, Perrys Cave, Seneca Caverns, Squire Boone Caverns. The more recent cave trips are accompanied by photo galleries that you don't want to miss. Since about 2004-5 I've gotten much better at cave photography. There are also some videos for a number of caves. I have a fix (Windows only) for some of the video problems people have had with my newer movies. My video camera uses a bizarre codec for its AVIs. If there are AVIs you are having trouble with download and install this codec (1.1 MB). But that is just for the newer AVIs. The other movies should just work if you have quicktime. On 19 Aug 2006 I got a caving blurb in the Rocky Mountain News, a Denver newspaper. With this latest quote, this makes 3 papers and 1 radio interview plus possibly an NPR sound bite in which I've either been featured or quoted. This is the first caving related quote. Here is the article: Hollowed territory. The RMN eventually will archive the article online but charge for access. Don't be shy about asking for autographs. Not much props considering the reporter found my site first, got a thorough interview from me, and then I directed him to CavesR4All. Oh well.